Chhangte is the latest Indian to go to Norway for trials after Gurpreet Singh Sandhu. A COUPLE of years back, Lallianzuala Chhangte caught the attention of the country’s football fans with his blinding pace. In an Indian Super League game, the Delhi Dynamos midfielder from Mizoram, just 19 then, sprinted from the centre line to score a cheeky goal. According to the graphic put out by the broadcasters, Chhangte’s top speed during the run was 35.8kmph. An end of the season an international study that year revealed he was just behind Welshman Gareth Bale (36.9kmph) and Colombia’s Orlando Berrio (36kmph) in terms of pure speed. Those fleet feet are taking him places. A few senior officials from Norway’s most successful club, Viking FK, saw a Delhi Dynamos match at the capital’s Jawaharlal Nehru Stadium. Chhangte’s speed caught their attention and after a series of back-and-forth with the representatives, they decided to give the 21-year-old a chance to play for their club. On Monday, Chhangte will begin his trial stint with Viking. He has a week to show he has what it takes to compete in Europe, a footballer’s El Dorado. At present, no Indian footballer plays professionally outside the country. Incidentally, the last one to do so — goalkeeper Gurpreet Singh Sandhu — also played in Norway, for top division club Stabaek. “I have been talking to as many people as possible to understand what to expect there. There are players in my team (Delhi Dynamos) who have played in those conditions. I don’t have much time so I will have to adjust to the weather and style of play as quickly as possible. I know it is tough. But I have come this far, I believe I can take one more step,” the India international says. It’s easy to lose the sense of distance when Chhangte talks about ‘coming this far’. Chhangte’s journey began in Lunglei, a Mizo town so remote that it isn’t connected to any Indian city by rail or air while roads are winding and treacherous, with a perennial risk of them being blocked due to the frequent landslides. It was here that he was born to a family of modest means, one where his father Hriatpuai, a school teacher, insisted on him taking education seriously while a football-mad grandfather, Dochhunga, nudged him towards a sporting career. “My mother Lalroliana tried to balance it, but sometimes she sided with my grandfather,” Chhangte says. Although football is considered to be the biggest sport in Lunglei, there weren’t any grounds to play in Chhangte’s growing up days. He began playing on a concrete basketball court and it wasn’t until 2013, when the town got its first football-specific artificial turf, that he played on a proper surface. And that too was possible only by sneaking in at ungodly hours. “We could play there only from 4 in the morning till 6 because after that the older players used to come,” Chhangte, who played drums for a local band, says. Here he was spotted by Mawkima, who ran a local club. Chhangte calls Mawkima as his ‘football father’ and he became one of the youngest players in the club. In a way, Chhangte’s story is also an ode to Mizoram’s football culture. One of the reasons why North Eastern state has emerged as a hotbed for talent is because, unlike most other places, it provides opportunities for young players to play competitive football from an early age. By the time he hit his teens, Chhangte was regularly playing the inter-village tournaments, which form the fabric of Mizo football. He then went on to play in the Mizo Premier League, which is broadcast live on the cable television across the state. In 2014, he was picked up by Pune-based DSK Shivajians’s Liverpool International Academy, whom he represented in the under-18 I-League. His performances in the national youth league opened the doors for much bigger things. In December 2015, he became the second youngest player to make his India debut and in the same month, then 18 years and 140 days old winger became the country’s third-youngest goal-scorer, when he netted a brace against Nepal. The following year, he spent a week with Liverpool’s U-18 team and got a taste of the demands of playing in Europe. 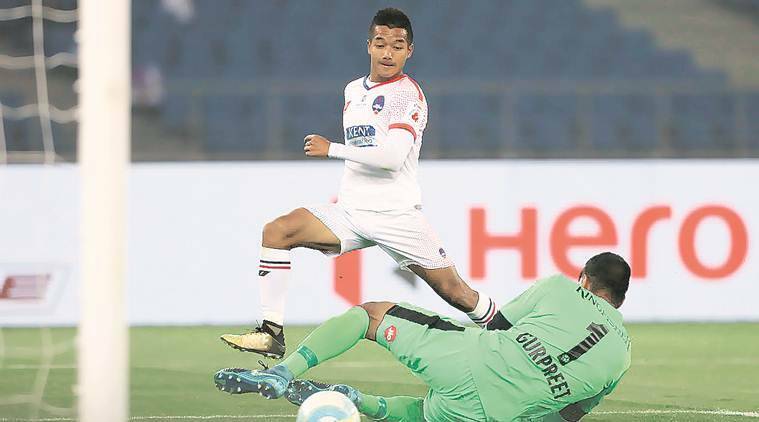 That experience, he says, leaves him in good stead heading into the Viking stint, which took shape after the Norwegian club’s senior officials saw him at a match in Delhi last year. Chhangte is conscious of the fact that calls like these often come with several pitfalls. The fine line between a genuine trial and a marketing gimmick often gets blur in the context of Indian footballers. “I know it’s not going to be easy. But let’s take it step by step,” he adds.